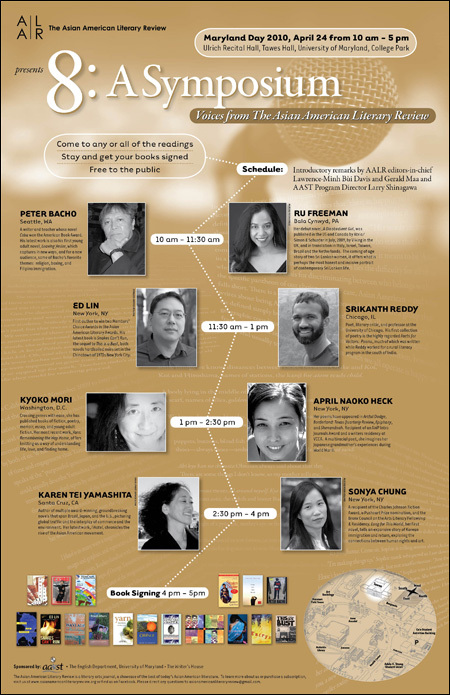 A day-long celebration of eight of today's most accomplished and exciting Asian American writers. Come to any or all of the readings; stay for the Q&A sessions, and don't forget to get your books signed by the authors. As a part of Maryland Day 2010, sponsored by the University of Maryland, College Park, the Symposium will be held on April 24th, 2010, from 10 a.m.-5 p.m. at Ulrich Recital Hall, Tawes Hall. Free to the public. Sponsored jointly by The Asian American Literary Review and the University of Maryland's Asian American Studies Program, Writer's House, and English Department. Please direct any questions or inquiries about press coverage to editors@aalrmag.org. That's a solid, diverse lineup of literary talent hanging out in Maryland on Saturday. For more information, take a look at the Facebook event page here. And to learn more about the Asian American Literary Review, go here.